Due to conflicting reports regarding growing conditions and final usage of this new world, gluten-free pseudo-cereal plant, OU Kosher was hesitant to conclusively declare it Kosher for Passover and non-kitniyot. 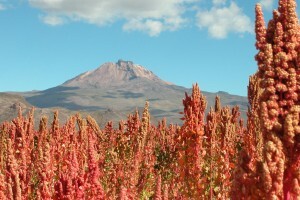 Following extensive research and on-site investigation of cross-contamination issues by OU Kosher personnel at all quinoa growing areas including: Puno, Cuzco, Arequipa, Ayacucho, Junin and Chiclayo in Peru; and Alto la Paz and Chayapata in Bolivia; as well as the collection, washing and milling stations of quinoa, OU Kosher is pleased to announce that, for the first time, it is recommending quinoa for Passover, when processed with special OU Passover supervision and bearing the OU-P symbol. See the Passover product search for Passover approved brands.